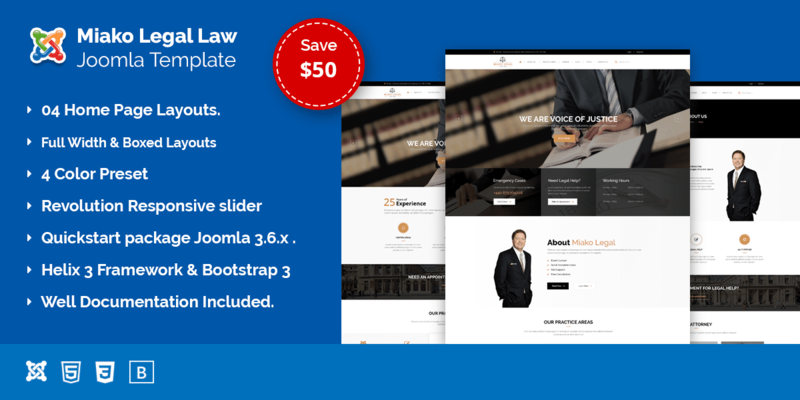 Miako Legal Law Firm Joomla Template One of the Clean and well Documented Joolmla Responsive Template for Law Firm. It has 4 home pages and 4 different color variations. All codes are HTML5 and CSS3 validated and all browser compatible and all device supported. Miako Legal template main purposes to use on Law Firm, Lawyer Institute, Personal Law business and Law Firm Business. Premium Extensions included – $50 saved. Supports all modern browsers Chrome, Safari, Firefox, IE. Use Google font Raleway, OpenSans and Droid Sans.